I been using Android messenger and it's horrible. Messages are being delayed then received in "batches". The stock messenger app is really umm, ugly but it works. I was curious what other reliable messenging apps people are using. I was using textra on my s7 but I just saw a thread here that it's not sending pictures on the s8. That is correct. I had changed to Textra which I like but I was unable to send picture texts on it. I had to go back to the stock message app which fixed the issue. Not sure why picture texts weren't working on Textra. It's typically a good messaging app. Textra is still working fine on my unlocked S8. I was having good luck with Android Messages, but the only 2 messaging apps which work with my Gear S2 are the stock messaging app (which I don't care for at all) and Verizon Message + which my only current beef with is that they don't allow color customization and no gif support. I've been a Yaata user for some time. Love the customization and dark theme. I love YAATA and the insane amount of customization it has. I just discovered that the default app doesn't allow me to attach gif's from my Gboard keyboard. l gave verizons messenging program a try and that doesn't accept Gboard gifs either. I need my saving kittens so it's back to Android messenger for now. *sigh. Yaata at my S8+ and my Pixel XL. Been using Textra for years. Never had a problem. Still don't with the s8+. Probably have to be a Verizon customer to use this app...but I like it because there's also a program for the PC that auto-syncs all of your texts and allows you to send texts from the computer as if it were the phone. I've been plagued by messages not sending with stock, AM, and txtra. Not sure if anyone having issues are T-Mobile customers with digits, but disabling digits on the phone seems to have fixed everything. haven't had an issue sending or receiving since I did it. Does it pick up each contacts custom ring and text tones? I had to set them again in textra. My only major gripe with textra. Aren't those controlled by your Contacts app, not the messaging app? I'm going to second @tracypagedotnet. 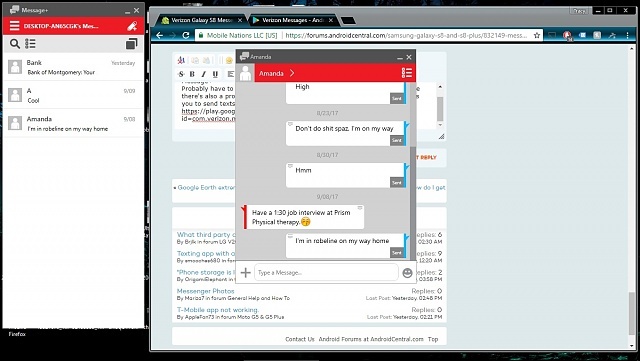 Verizon Messenger+ I use it on my S8+, Tab S2 (WiFi only), Surface Pro 3, and HP desktop. There is also an iOS version (both iPhone and iPad); I don't know if there is a Mac OS version though. I get text messages on all my devices. You do not need to be a Verizon customer to use Verizon messages. Textra sends pictures on my AT&T S8+ with no issues. It also sends with no issues on my Verizon J7. What third party camera app. are you using? Texting app with a Signature line! !